This interpretation has been rejected by the Ministry of Environment and Forestry’s director Putera Prathama: “I need to emphasize that what has been reported by mongabay.com is legally and technically incorrect. The reporting by mongabay.com is not based on the letter that I sent to the APP companies concerned,” Dr Putera Prathama, the Ministry’s Director General of Sustainable Production Forest Management, told foresthints.news on Thursday (Dec 22) at the ministry office. “My letter specifically addressed the clearing of non-peatland areas burned in last year’s fires as a way of avoiding any future land and forest fires,” Putera explained, adding that the clearing of land for fire prevention, has not to been confused with replanting acacia in burned areas. 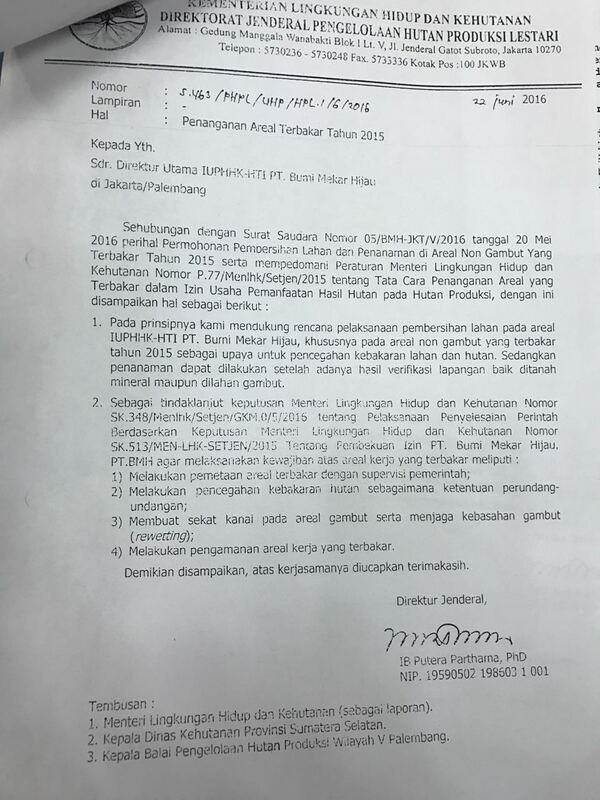 “In my letter from mid-May 2016 in response to a letter from one of the APP companies operating in South Sumatra, I also asked the company to revise its 10-year work plan. However, the fact is that of the APP companies whose concessions contain significant amounts of burned peatlands, none have revised their work plans as yet,” bemoaned the Director General. Putera took the opportunity to reconfirm that the replanting of acacia in burned peatlands by APP companies was actually in contravention of the prevailing regulations.